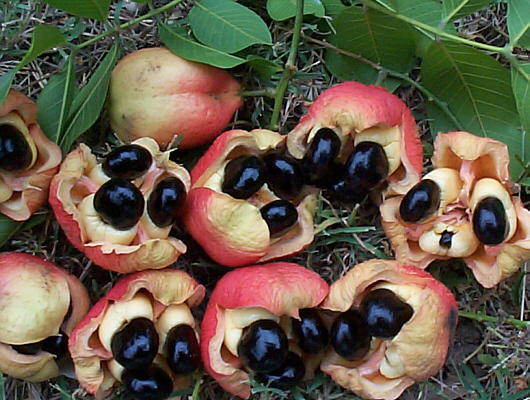 Ackee is the national fruit of Jamaica and is borne in clusters on an evergreen tree. Its name is derived from the West African Akye fufo. 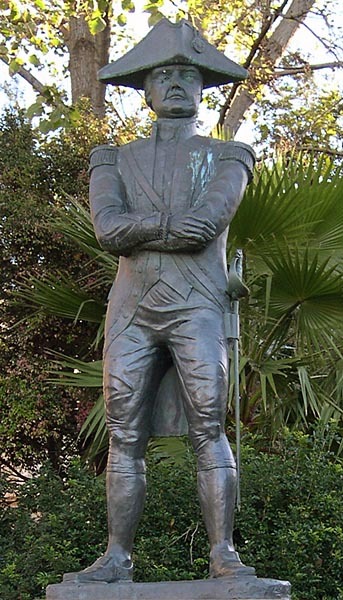 The tree is not endemic to the West Indies but was introduced from West Africa during the 18th century. 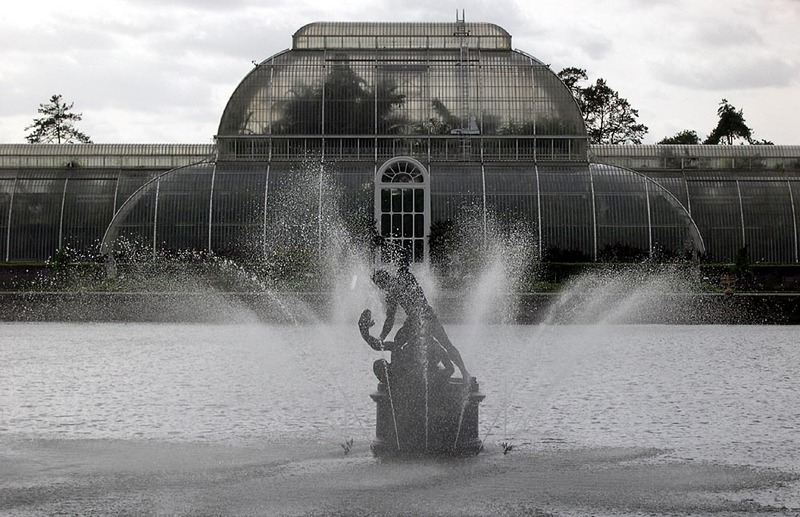 The plant was named Blighia sapida in honour of Captain William Bligh who in 1793 took samples to Kew Gardens in South London. 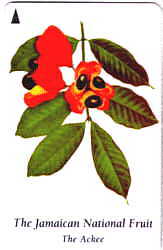 Ackee trees are found across the island of Jamaica but the main producing areas are located in Clarendon and St Elizabeth. There are two bearing seasons: between January to March and June to August. The fruit turns red on reaching maturity and splits open with continued exposure to the sun. 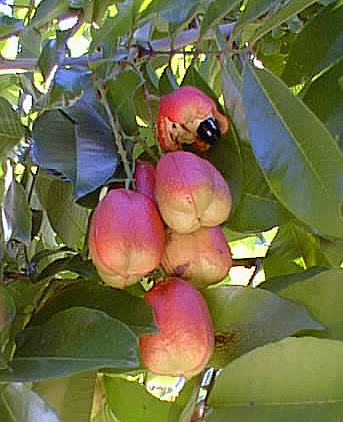 Traditionally it is at this time that the ackees are harvested and the edible portion (the arilli) removed and cleaned in preparation for cooking. This delicacy is enjoyed by many at breakfast or as an entree. The canned product is exported to ethnic markets worldwide and continues to be enjoyed by both visitors to the island and Jamaicans residing overseas. Consumers of the unripe fruit sometimes suffer from 'Jamaican vomiting sickness syndrome' (JVS) allegedly caused by the unusual amino acid components, hypoglycin A and B. In this regard it is recognised that the nutritional status of the consumer is important, since diagnosed patients generally show manifestations of chronic malnutrition and vitamin deficiency. Although JVS has resulted in some fatalities in the past with symptoms including vomiting and severe hypoglcaemia, nowadays such incidences are rare with the increased awareness of the necessity for consuming only ripe, opened ackees. Levels of hypoglycin A in the ackee arilli peak at maturity but rapidly diminish to non-detectable levels in the opened fruit making it safe for consumption. Studies  done in the Biochemistry Department at UWI, Mona on the fatty acid composition of the arilli from ackee have found that 51-58% of the arillus dry weight consists of lipids. Linoleic, palmitic and stearic acids were the major fatty acids observed with linoleic accounting for over 55% of the total fatty acids. 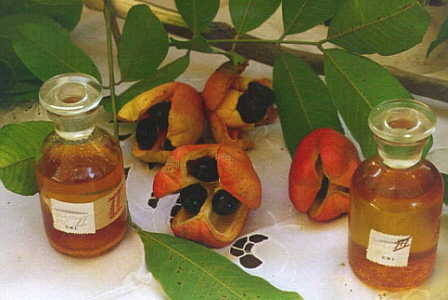 These results show that the purified oil from ackee has high nutritive value and makes an important contribution to the fatty acid intake of many Jamaicans. According to CFNI's "Food Composition Tables for the English-speaking Caribbean" (1998) the contents of a 100g serving of "Ackee, canned, drained" are as follows: Water (76.7 g), Energy (625 kJ or 151 kcal), Protein (2.9 g), Fat (15.2 g), Saturated fat (0 g) Cholesterol (0 mg), Total carbohydrate (0.8 g), Dietary fibre (2.7 g), Calcium (35 mg), Iron (0.7 mg), Potassium (270 mg), Sodium (240 mg), Zinc (1 mg), vit A -, thiamin (0.03 mg), riboflavin (0.07 mg), niacin (1.1 mg), total folacin (41 microgram), vit C (30 mg). 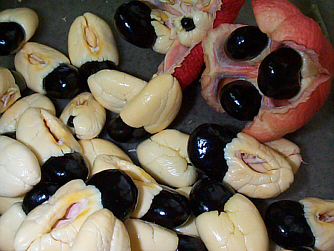 A number of other metabolites have been isolated from the ackee fruit that show unusual structures as well. Blighinone, a sparingly soluble quinone was isolated from the arilli of the fruit. Vomifoliol, has been isolated from the leaves and stems of the plant and has been implicated in the endogenous regulation of stomatal apertures. More recently, another non-proteinogenic amino acid (2S, 1'S, 2'S)-2-(2'-carboxycyclopropyl)glycine (CCG 1), was isolated from the fruit. It is similar in structure to hypoglycin A with respect to the presence of a cyclopropane ring structure which is a rare occurrence in nature. An IR spectrum of ackee oil is available in JCAMP-DX file format. Lewis, C. B., Information Bulletin of the Scientific Research Council, 1965, 1, 12-14. Odutuga, A.A., Asemoto, H.N., Musac, I., Golden, K.D., and Kean, E.A, Jamaican Journal of Science and Technology, 1992, 3, 30-32. Garg, H.S. and Mitra, C.R., Tetrahedron Lett., 1968, 9(13), 1549-1552. Stuart, K.L., Roberts, E.V. and Whittle, Y.G., Phytochemistry, 1976, 15, 332-333. Natalini, B., Capodiferro, V., De Luca, C. and Espinal, R., J. Chromatography. A, 2000, 873, 283-286. Return to links to the chemistry of other Jamaican items, including spices and fruit and vegetables. Copyright © 1995-2013 by Robert John Lancashire, all rights reserved. Created Feb 1995. Links checked and/or last modified 17th November 2013.